Patients in critical care settings are at increased risk for developing ocular complications, most commonly as a result of excessive exposure and drying of the surface of the eye. Proper, simple eye care measures can decrease the incidence of sight-threatening infections and scarring that can yield long-term problems for a patient who was otherwise successfully treated during their time in the critical care unit. 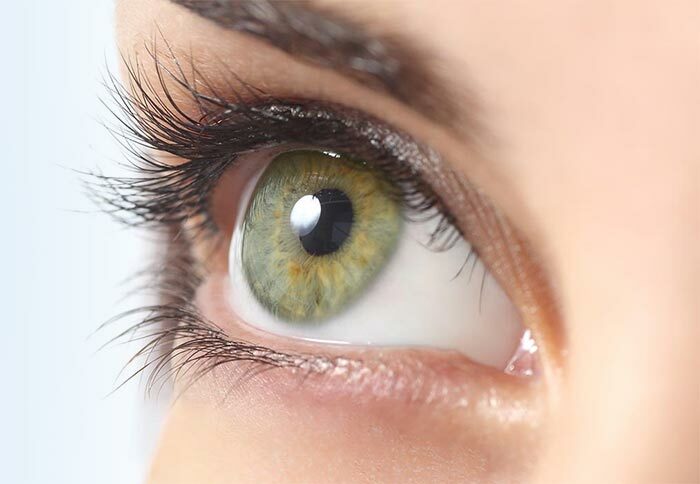 Additionally, for patients who are terminally ill, proper eye care will help maintain the health of the corneal tissue and preserve the option of eye donation for the patient or the patient's family members. Clear vision requires light to be precisely focused on the nerve layer (retina) that lines the internal aspect of the posterior eye wall. Approximately 70% of this focusing is accomplished by the cornea — the clear dome over the central portion of the front of the eye. Any scarring or distortion of the central cornea, or the tear film coating the cornea, will yield blurring of the vision. Any significant disruption of the tear film not only blurs vision but also places the underlying corneal tissue at risk for infection and subsequent permanent scarring. The cornea is an avascular structure composed mainly of precisely arranged collagen fibers and glycosaminoglycans. It depends on the constant turnover of the tear film via blinking to protect it from infection. Tears contain a number of substances, such as lysozyme and immunoglobulins, that have antimicrobial properties. Additionally, the thin layer of epithelium covering the cornea provides a potent barrier to microbial invasion. The health of this avascular epithelium is dependent on the supply of oxygen and nutrients provided by tears. A stagnant tear film and drying of the corneal surface decrease the antimicrobial effect, weaken the epithelial barrier and may allow increased localized bacterial proliferation. Breaches in the epithelium expose the underlying corneal proteins to bacterial invasion, which can occur aggressively with devastating visual consequences. Many critical care patients are sedated, both medically and as a result of their systemic illness. Sedation decreases the blink rate and predisposes the ocular surface to desiccation. At particular risk are patients receiving mechanical ventilation. These patients are often treated with muscle relaxants that impair closure of the eyelids. During sleep the eyelids close via active, tonic contraction of the orbicularis oculi muscles. Paralysis of these muscles yields closure to the eyelids only via passive means (i.e. gravity), and this frequently yields incomplete closure known as "lagophthalmos." Increased jugular venous pressure from mechanical ventilation can also lead to fluid buildup, known as chemosis, under the conjunctiva. The conjunctiva is a stretchy mucous membrane covering the white part of the eyeball (sclera). This chemosis can be quite pronounced, with conjunctiva protruding over the lower eyelid. This condition can yield further impairment of passive eyelid closure and increased drying of the ocular surface. Positive end expiratory pressure (PEEP) of 5 cm H20 and above is thought to worsen conjunctival chemosis by decreasing venous outflow from the head and neck. Corneal infections are most commonly caused by the patient's own bacterial flora. It is important that the patient's face is kept clean and that care be taken to protect the patient's eyes when suctioning gastrointestinal or respiratory secretions. Introduction of bacterial flora from these sites onto a compromised ocular surface can yield aggressive bacterial infections. Assessment of a critical care patients' eyes should routinely be done during each nursing shift. Checking the eyes of patients who are not sedated and ventilated will allow nurses to gain an appreciation of the normal appearance of the eye. Most ocular problems in critical care patients arise from lagophthalmos, which generally increases in severity with increased sedation. It is important that eyelid position be carefully assessed. Using a penlight or flashlight will help reveal poor lid closure, which might be masked by the eyelashes. Excessive exposure can lead to breakdown of the corneal epithelium, known as keratopathy. This can be recognized as an irregular reflection of light from a penlight off the corneal surface. Lubricating ointments can also disrupt this reflection, but a gentle rinse of the ocular surface with sterile saline will rinse the ointment away. This irregular reflection of light indicates an inadequate tear film and a breakdown in the integrity of the corneal epithelium. This places the cornea at risk for infection. Exposure keratopathy can lead to keratitis — a term for any corneal inflammation, infectious or otherwise. Bacterial keratitis in the critical care setting has an increased association with aggressive Gram(-) bacteria such as Pseudomonas. Once these bacteria gain entry into the subepithelial corneal collagen, rapid destruction of corneal tissue can occur. An infectious corneal ulcer will appear as a whitish area on the corneal surface. It is often accompanied by a purulent discharge. Severe dryness can also yield whitish opacities of the cornea. Therefore, an ophthalmology consultation is recommended for any new, white lesions noted on the cornea. Following infection, the orderly arrangement of corneal collagen fibers is disrupted and the resultant scar tissue yields permanent vision loss, which may require a cornea transplant for visual rehabilitation. The risk of this dire consequence may be greatly diminished if the early signs of lagophthalmos and exposure keratopathy are recognized and treated. Prevention of ocular complications in critical care settings begins with an awareness of the potentially devastating consequences of corneal infections. Both the evaluation and treatment of ocular surface exposure and dryness are relatively simple and minimally labor-intensive, but nevertheless effective. Each assessment of the patients by the nursing staff should include an evaluation of the adequacy of blinking and eyelid closure. If the eyes appear closed, careful inspection with a penlight or flashlight should be performed to assure the lids are, in fact, completely closed. As mentioned before, the eyelashes may hide the fact that the lids are not completely closed, allowing the ocular surface to dry out. In a sedated patient with seemingly closed eyes, the upper eyelids should be manually elevated to allow inspection of the cornea. A piece of gauze helps with manual traction of the eyelids if they are oily. Does the tear film appear uniform or is the light reflection irregular? Sterile saline may be used to rinse away any mucus or lubricant ointment, thus allowing better assessment of the corneal surface. Any patient with signs of exposure keratopathy, lagophthalmos, or a decreased blink rate (normal blinking occurs every 5-10 seconds) should be treated every 4-6 hours with an ocular lubricating ointment such as Lacrilube. Ointments moisturize the ocular surface more effectively than drops. The ointment should be placed along the internal surface of the lower eyelid. The lids should then be manually closed to spread the ointment over the ocular surface. Once again, if any whitish corneal lesions or purulent discharge develops prompt ophthalmologic consultation is indicated to rule out corneal infection. A small amount of non-purulent mucous buildup is common in cases of exposure keratopathy. In cases of significant exposure, whether from decreased blinking or poor lid closure, lubricant ointment should be applied every 4 hours. Prolapsed, chemotic conjunctiva can further worsen the exposure problems. In addition to lubricant ointment, polyethylene moisture chamber (i.e. Saran Wrap) may be placed over the skin in a strip from temple to temple, wide enough to cover the lower forehead, bridge of the nose, and upper cheeks. This will create a "moisture chamber" over the eyes. A small amount of petroleum jelly on the skin of the brow, temples and cheeks will create a tighter seal by the cling wrap, but still allow easy removal for inspection and application of ointment. The cling wrap should be changed each shift to lessen the risk of infection. Additionally, visitors to the patient should be briefed on the need for the cling wrap to avoid any undue alarm. Cortese, D., Capp, L., McKinley, S. “Moisture Chamber Versus Lubrication for the Prevention of Corneal Epithelial Breakdown.” American Journal of Critical Care 1995; 4: 425-8. Cunningham, C., Gould, D. “Eyecare for the Sedated Patient Undergoing Mechanical Ventilation: the Use of Evidence-Based Care.” International Journal of Nursing Studies 1998; 35: 32-40. Dua, H. “Bacterial Keratitis in the Critically Ill and Comatose Patient.” Lancet 1998; 351: 387-8. Farrek, M., Wray, F. “Eyecare for Ventilated Patients.” Intensive and Critical Care Nursing 1993; 9: 137-41. Hernandez, E., Mannis, M. “Superficial Keratopathy in Intensive Care Unit Patients.” American Journal of Ophthalmology 1997; 124: 212-6. Lenart, S., Garrity, J. “Eye Care for Patients Receiving Neuromuscular Blocking agents or Propofol during Mecahnical Ventilation.” American Journal of Critical Care 2000; 9: 188-91. McClellan, K. “Mucosal Defense of the Outer Eye.” Survey of Ophthalmology 1997; 42: 233-46. Mercieca, F., Suresh, P., Mortan, A., et al. “Ocular Surface Disease in Intensive Care Unit Patients.” Eye 1999; 13: 231-6. Parkin, B., Turner, A., Moore, E., et al. “Bacterial Keratitis in the Critically Ill.” British Journal of Ophthalmology 1997; 81: 1060-3. Suresh, P., Mercieca, F., Morton, A., et al. “Eye Care for the Critically Ill.” Intensive Care Medicine 2000; 26: 162-6.